The 9th Annual Chili At The Beach heats up Main Street on Saturday, June 18, in a delicious family-friendly culinary competition benefiting the Boys & Girls Clubs of Huntington Valley. Taking over the first three blocks of Main Street from 11 a.m. to 5 p.m., the annual chili cook-off features chili, salsa, and craft beer tastings; live music; vendors; and more. It’s the perfect Father’s Day gift for dads who crave the spice of life. Attendees will stroll Main Street between Pacific Coast Highway and Orange Avenue, sampling chili and salsa from two dozen booths and marking their favorites on ballot cards. Judges will taste “blind” samples, and at the end of the day, two chili purveyors and two salsa purveyors will be crowned best of the beach, vying for wins in Judge’s Choice “Best Chili,” Judge’s Choice “Best Salsa,” People’s Choice “Best Chili,” People’s Choice “Best Salsa,” Best Chili Name, Best Salsa Name, and Most Enthusiastic Booth. Participating Huntington Beach restaurants include Fred&apos;s Mexican Cafe, Duke&apos;s, Sandy&apos;s, Longboard Restaurant & Pub, 2nd Floor, Gallagher&apos;s, BLK Earth Sea Spirits, Avila&apos;s El Ranchito, Black Bull Chop House, George&apos;s Grill, Ola Mexican Kitchen, Super Mex, and Slater’s 50/50, along with several local chefs and residents. Competitors have their spoons set on three-time People’s Choice winner Chili Royale. Vendors will showcase products of interest to Dad, including a few Surf City Nights (weekly Tuesday night downtown farmers market and street fair) favorites, like personalized man cave signs, Backyard Mary Bloody Mary Mix, Rockin’ Rubs, and more. For the kids, bounce houses, inflatable slides, and carnival games will offer endless fun. Tickets cost $10 online and at the Surf City Nights info booth, or $15 day of, and include unlimited chili and salsa tastings. Attendance is free. Brewhounds can purchase separate $5 tasting cards, loaded with six different four-ounce tastings of craft and specialty brews. 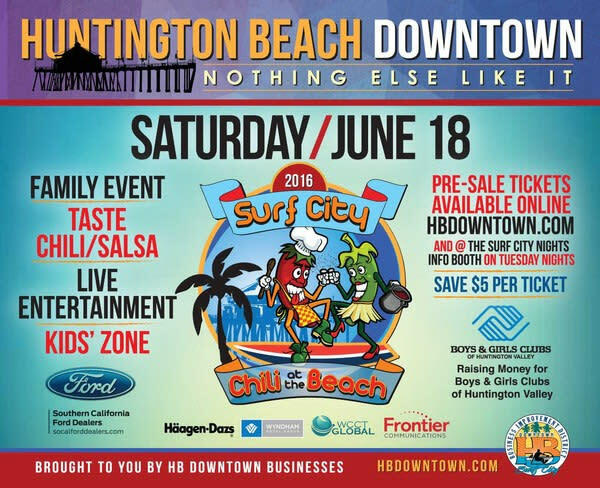 Sponsored by the Huntington Beach Downtown Business Improvement District, Chili At The Beach has donated more than $25,000 to the Boys & Girls Clubs of Huntington Valley over the past three years. Let’s don our bibs for the kids!